This isn’t going to be a mushy post about how much I love and adore my husband, Justin… although I do, a lot! He’s pretty amazing and makes what can be something complex (i.e. love) pretty simple. However, in this post I’m referring to the evolution of this project. How what I originally had planned as something more elaborate, changed into something pretty simple. Many of my projects evolve during the process and turn out differently than how I first imagined them… they just usually get more complex, not the reverse. I bought the frame, letters and heart for this project more than a year ago. Not that it was going to be an anniversary gift FOR Justin, but rather one for US - one I would make for our bedroom wall. My original intent was to take our vows or the words from our first dance song and either write, print, or paint them, along with our wedding date, on a board as the background behind the “T”, heart, and “J”. After briefly playing around with the words, I decided that I didn’t think it was going to work the way I had hoped. Most likely I needed a bigger frame or smaller letters and heart that could be tucked into the corner of the frame rather than fill the entire space. Since I already had the materials (as they were sitting around for a year without me doing anything with them) I decided to move forward and create something anyways. I stained the letters with wood stain I had in the basement. They were made of a very porous material, so I just dripped the stain on and let them sit out to dry on plastic plates. I soaked the wooden heart in beet juice until it evaporated which only took a few days (it just so happened I was eating Love Beets around that time - packaged with plenty of juice). Next, I cut a piece of plywood the exact size for the frame and covered it with burlap by folding the edges over to the back and using hot glue to tack it down. Then I glued that into the open back frame (no need for fancy framing tools like a point driver) and completed it by gluing the letters and heart on the front. I tried a few other ideas I had, but in the end, this project was screaming for me to stop - its beauty is in its simplicity. I was going to make this part of a larger project - such as a wall collage of photos and other burlap and wine cork art pieces. But, once I placed it on our dining room buffet console (in place of where our wedding guest signature plate was), I fell in love with it there. It just naturally found its home - and became the perfect update to our dining room. Whether displayed on a console table or paired with candles on the fireplace mantle - it’s simple design lends it to be used in various ways. 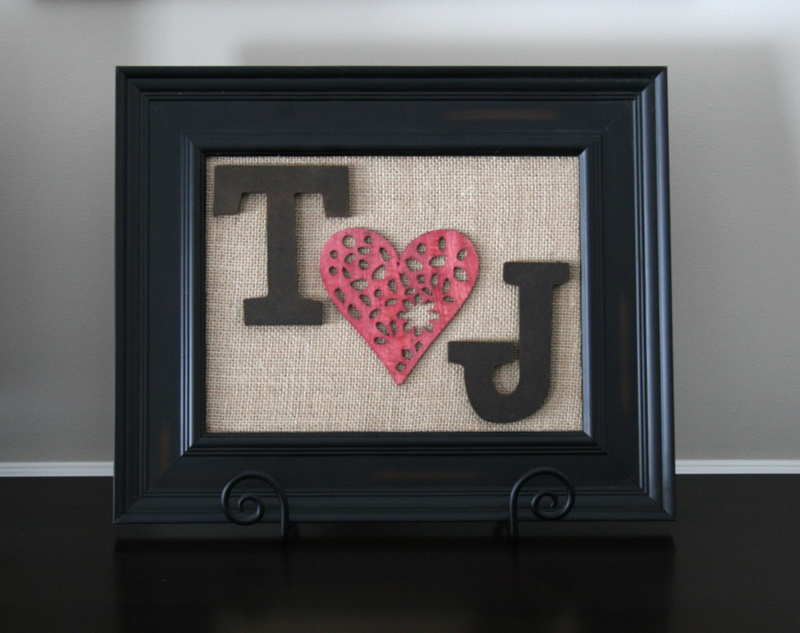 I may still work towards a collage wall incorporating other burlap designs… but for now, I’ll just add those ideas to my craft list.